Nassau County Legislator Rose Marie Walker was pleased to attend the 50th Anniversary Celebration of the Farmingdale-Bethpage Historical Society which was held at the Blue Lagoon Restaurant. The Farmingdale-Bethpage Historical Society encourages and develops the historical appreciation of the public by promoting study of Long Island's past, especially that of the area once known as the Bethpage Purchase. They promote appreciation for the area's heritage by encouraging preservation of structures of historical or architectural significance. 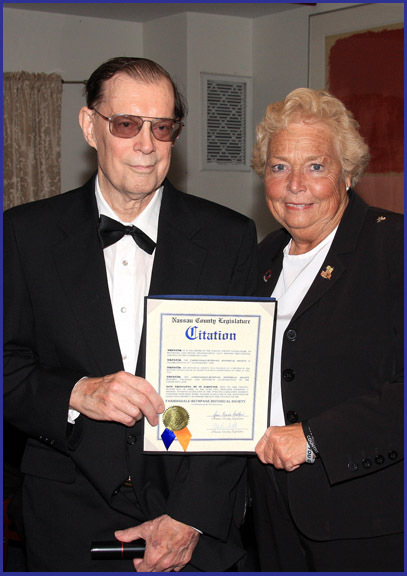 Shown in photo: Eric Goldschrafe, President of the Farmingdale-Bethpage Historical Society with Nassau County Legislator Rose Marie Walker.